This was inspired by another post on Barbara Gray's new blog .. I'm loving all the tips re playing with the gelliplate because I haven't used mine much because I wasn't confident but now I just want to play and experiment. 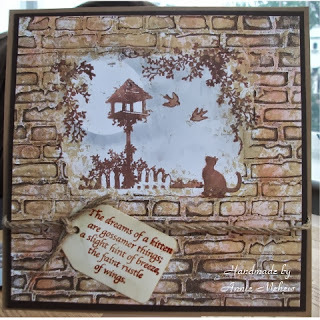 I loved this as soon as I saw it because I saw the potential to make a card for a neighbour who is a cat owner ... can't believe I am already talking about cards for 2014. I still have all my Christmas cards and one very special birthday before 2013 is out. This was really lovely to do in fact I made 2 backgrounds while I had all my stuff out and on the plus side nothing went in the bin apart from some spare copier paper I had used. WOW! Annie, This is BEAUTIFUL! Really BEAUTIFUL! Your neighbor is going to love it and the sentiment is lovely. This is just WONDERFUL Annie!!! I would love to explore this technique! You'll have to give me some pointers!!! !